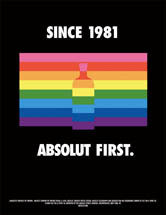 This is a variation of an unofficial 1996 rainbow bottle ad titled "Absolut Pride." One of the most venerable brands in the gay market, Absolut has had a consistent presence for over 25 years gracing the back covers of gay magazines years before any other major advertiser. Yet for all its recognition in the gay market and longterm presence, Absolut has only done a handful of truly gay-specific ads. But the company has been very involved in gay events, such as the GLAAD Media Awards (sponsored since 1989) and in 2000 it sponsored Absolut Tom, the fall collection of Tom of Finland, a clothing extension of the homerotic gay artist.